Camp Moremi is an authentic safari camp combining warm African hospitality with superb game viewing. Beautifully furnished East African style safari tents with private facilities and situated on the Xakanaxa Lagoon in the Moremi Game Reserve. 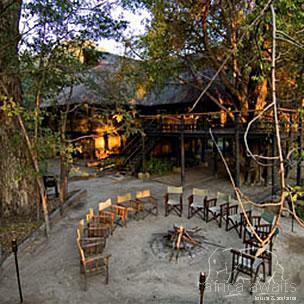 Camp Moremi is an authentic safari camp combining warm African hospitality with superb game viewing. 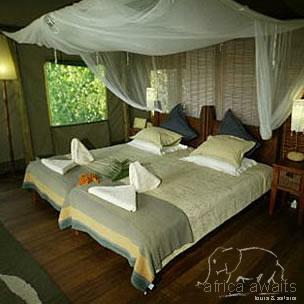 Accommodation in Camp Moremi is in 11 East African styled tents with private hot showers and flushing toilets. Camp Moremi accommodates only 22 safari guests in beautifully furnished East African style safari tents with private facilities. The elevated Moremi Tree Lodge is the stunning focal point of Moremi Camp and houses the luxurious main lounge, a wildlife reference library, dining room and cocktail bar, shaded by giant Ebony trees and overlooking the Okavango Delta's Xakanaxa Lagoon. Each tent is exquisitely furnished with a Rhodesian Teak wardrobe, luggage rack, dressing table, bedside pedestals and traditional directors chairs; colourful woven rugs, designer linen and matching interior blinds complete your African hideaway. 'His and hers' towel robes as well as tea and coffee making facilities are also provided to make your stay as comfortable as possible. Each guest unit has its own private bathroom situated adjacent to the tent and located on the raised platform. 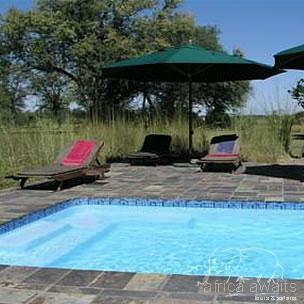 With your holiday, safari or business trip from in to Camp Moremi in Botswana.